SteamPunk Glass: Neil Armstrong, the last pioneer? I was going to post about a recent trip, but in light of Neil Armstrong passing away this weekend I thought I'd share some thoughts, and some things that I've read in the press that have made me wonder if we've reached the pinnacle of our civilisation and are now on the slide down the other side? I was checking up on Twitter news on Sunday morning with my first coffee of the day when I learned that Mr Armstrong had passed away. I also learnt way too much about half baked sloppy press at the same time. Ed Yong (Edyong209) had collected together some rather appalling instances, I thing they've been corrected but if you plough through his twitter feed he's recorded photo's of the various pages and web articles. NBC, who as an American website should have know better, listed him as Neil Young; a Dutch paper claimed he was the first man to walk on Earth; and even the UK slipped up saying he was the first US woman in space. I believe the correct Internet hash tag here is #palmface. I can't say any of my reading got any better when I found out there were people asking who he was, someone who decades before had the entire world gathered around TV sets to see grainy pictures of him stepping down onto the dusty moon surface. 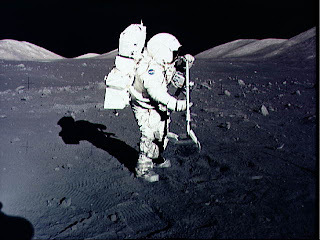 But then, as others pointed out, nobody born since 1935 has walked on the moon. Very soon there will be nobody alive who has been there, and there doesn't seem any real will to go back. 'We have enough problems down here to deal with,' is what most people will say. I don't know if that's right or wrong, but these large scale projects do bring benefits that are unexpected, in this case Velcro, and seeing how small an isolated how vulnerable home really is. Today people wonder what's the point of the CERN collider, but I only recently learnt that off-shoots of this technology resulted in MIR scanners. The Earth is not flat, and neither is science; A sometimes takes mankind to K while on the way to B. Right now I'm reading Iain M. Banks sci-fi novels, who have civilisations which have 'Sublimed,' and have gone from technological zeniths and have withdrawn back into their own society and given up. Some days I do wonder if we're doing the same. Despite the inventions, the real outcome of the space race was to prove what amazing things man can do if he really tries, if real will is put behind in. What is also impressive is the man who got to make that boot print was refreshingly dignified and down-to-earth, and not big headed about it. Maybe if he boasted and hyped himself as much as people-who-kick-a-football for a living people under 18 may well know his name, but despite the odd reprint I'd hope his name is being learnt in 200 years time.